Bechamel—more commonly known as white sauce—is one of the five mother sauces. This most basic sauce in cookery is based on a roux, which is equal volumes of butter and flour. To make the sauce, a liquid (milk, cream or broth) is added and in just a few minutes, the liquid thickens nicely into a creamy sauce. 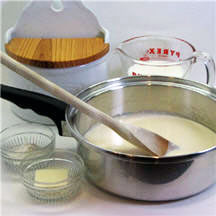 Bechamel is used as the base for favorite dishes such as scalloped or au gratin potatoes and macaroni and cheese. Stir in flour and continue cooking over medium heat, stirring constantly, until mixture is smooth and bubbly, about 30 seconds to 1 minute. Stir in milk or other liquid. Heat to a rolling boiling, stirring constantly. Boil and stir for 1 minute or until thickened. Season with salt and pepper to taste. Makes 1 cup sauce or 4 servings. Cheese Sauce: Stir in 1/4 teaspoon dry mustard with the flour. Once sauce is made, remove from heat and stir in 1/2 to 1 cup sharp cheddar cheese, stirring until melted. Curry Sauce: Stir in 1/2 teaspoon curry powder with the flour. Dill Sauce: Stir in 1 teaspoon chopped fresh, or 1/2 teaspoon dried dill weed and a dash of ground nutmeg with the flour. It is best to use warm to hot liquids when making sauce, which helps prevent lumps. Constant stirring will help prevent the sauce from scorching on the bottom. If sauce turns lumpy, whisk vigorously with a wire whip or strain through a wire sieve before serving. Nutritional Information Per Serving (1/4 cup of thin sauce using 2% milk): 63.1 calories; 57% calories from fat; 4.1g total fat; 12.5mg cholesterol; 163.0mg sodium; 94.4mg potassium; 4.3g carbohydrates; 0.1g fiber; 3.1g sugar; 4.3g net carbs; 2.2g protein. Nutritional Information Per Serving (1/4 cup of medium sauce using 2% milk): 95.6 calories; 64% calories from fat; 7.0g total fat; 20.1mg cholesterol; 183.5mg sodium; 97.4mg potassium; 5.8g carbohydrates; 0.1g fiber; 3.1g sugar; 5.7g net carbs; 2.5g protein. Nutritional Information Per Serving (1/4 cup of thick sauce using 2% milk): 128.2 calories; 68% calories from fat; 9.9g total fat; 27.8mg cholesterol; 204.0mg sodium; 100.3mg potassium; 7.3g carbohydrates; 0.2g fiber; 3.1g sugar; 7.2g net carbs; 2.7g protein.